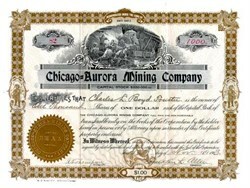 Beautifully engraved certificate from the Chicago- Aurora Mining Company issued in 1903. This historic document has an ornate border around it with a vignettes of men working a mine and a woman holding an old mining scale. This item is hand signed by the company’s president (Franklin L. Allen)and secretary and is over 97 years old.